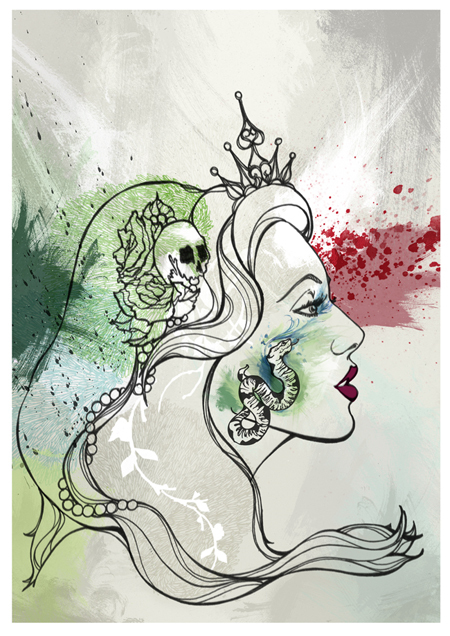 In this initial artwork I drew her sideways on, looking to the future, -her past clouded with jealousy and envy and the lust for something which is not rightfully hers (the throne of Scotland) her ruthless means of acquiring Macbeth’s ascension is represented by the snake coiled on her cheek as if whispering the dark, tempting thoughts inside her head. The jealousy and greed seeps through onto her cheek, instead of a healthy pink blush I have chosen the colours of envy, the makeup sweeping up to her eyes. It clouds her vision and she sees only blood in front of her, Macbeth’s murder of King Duncan.